Weight gain has forced me to be more active again, by engaging in daily exercise and making healthy food choices. I gained about 5 kilos since I started my new job. Considering that I am not a tall woman, a slight weight gain is already obvious. So last month, I decided my weight loss program. 5 kilos isn't that hard to lose, right? But it is not the case for someone who is not that big. In my case 5 kilos is still very hard to lose. So I decided to cheat a little. I tried a slimming coffee- SKINNY COFFEE by Sakura. Of course, I did my part of researching first. I am very well aware of the dangers associated with not going the natural way. My advise is to always go natural as much as possible. So anyway, I tried the Be Light 5 Day Program of Skinny Coffee by Sakura. The instruction says I must drink 1 cup of Skinny Coffee daily for 5 days, preferably every morning. The Skinny Coffee is supposed to curb your appetite and make you drink more water throughout the day. The ingredients will help you lose all those extra inches off your body. 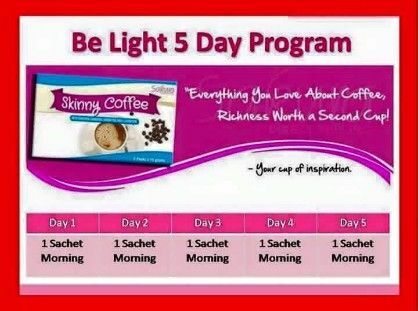 1 box of Skinny Coffee with 5 sachets costs 120 pesos to as much as 180 pesos, depending on the seller. I got mine from an online seller. 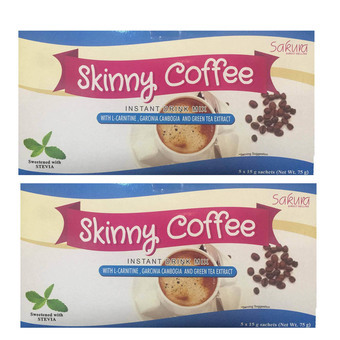 Please be aware that there are fake Skinny Coffee by Sakura, so be very very careful. So what did I feel while taking this slimming coffee? It tasted so good. It is just your ordinary coffee. I love the taste. I had no palpitations, no headaches, no dizziness. I also noticed that I was sweating more. I also was always thirsty so I up my water intake. I also did not feel that hungry as I used to feel without the coffee. So i continued the 5 day program. But there were times when I'd drink two cups of coffee a day. I heard feedbacks that those who drank it twice a day lost at least 2 kilos a week. But, that didnt happen to me. Did I lose weight drinking Sakura Skinny Coffee? Yes I did! I lost more than a kilo. But what I really noticed the most is my belly area. It wasn't bloated and I definitely lost an inch or so. Amazing! But I did not just rely on the coffee. I was doing exercises and I minimized my rice/bread/sweets intake. So I think it wasn't just the coffee alone. But guys, the changes in belly size is so noticeable. I really love it! Will I buy and take this coffee again? Yes but I will not be taking two cups a day and it won't be because of weight loss. I'll take this coffee because I love coffee. I still want the natural way of losing weigh though. NB: This is not a sponsored post. This is my personal opinion of the product. Panu po malalaman na fake po ung sakura skinny coffee? bili po kayo sa trusted na online sellers. :) or try nyo po sa lazada. baka po meron. 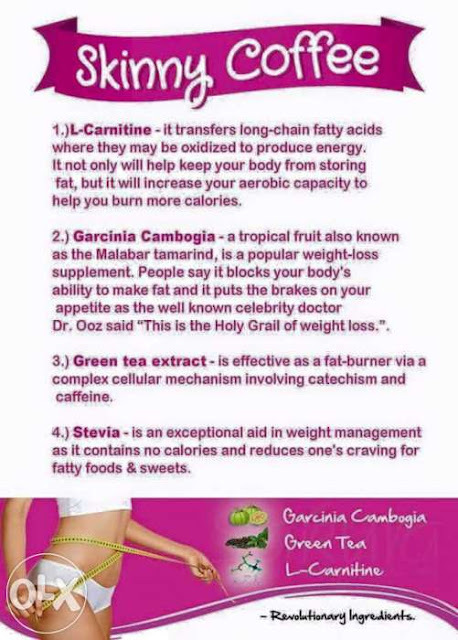 text or call 09298447228 kung gusto nyo po magorder ng sakura skinny coffee. P100 po per box ang kuha ko kasi nagmember ako, P130 pag hindi po member. Thanks for sharing. Would you mind sharing your seller too? Hi, my feeling was I am not sweating a lot through out the day, even when I drink water for almost 1 ltr. Maybe that's because I am working in the Office? But for me, I went to pee for how many times. And I don't have too much craving now for food. I just finish my 1 box and I lose 1 kg for that, it takes time. Will see it soon after I finish my 5 box. Where did you buy po? I'm an authorized reseller of skinny coffee in Las Pinas. You may contact me for orders at 09325472877. Hi, authorized seller ako nang skinny coffee. You can check my facebook page "Ellerine's Essentials." Hello. Where did you get your skinny coffee? I just bought it online and it's 285/box! Tip to know fake vs. original skinny coffee. Sa amoy at texture magkaibang magkaiba yung fake na mumuti kapag tinimpla naninilaw while yung original kapag binuksan maganda ang kulay parang 2in1 coffee ang kulay kapag tinimpla as is pa din sya para syang 2in1 coffee padin. Trusted distributor here.. Pm nyo na lang ako 0936747490 Thanks. May id din ako ng sakura direct selling corp. For validity.